After several early mornings and late afternoon “stake outs” at middle and high schools in my hometown of Grand Forks, I now know what it feels like to be a police officer. That’s because a little over a year ago, I had the opportunity to work with Safe Kids Grand Forks to observe the distracted walking problem in middle and high students in school zones. The data was then used for a national survey conducted by Safe Kids Worldwide called Alarming Dangers in School Zones. We sat in our cars and tallied how many times students crossed the street, whether it was a designated crosswalk or not, while distracted by their phones. We saw way too many kids staring at their phones, not bothering to look up to see if a car was coming. Already at that age, phones have basically become a part of their hands. After the initial observations, Safe Kids Grand Forks put up lawn signs around the school and spray-painted safety messaging on sidewalks in front of every crosswalk: Heads Up, Phones Down. A simple message, but nearly 60 kids under the age of 19 are hit by cars every day in the United States. Safe Kids Worldwide data showed that 1 in 4 high school students and 1 in 6 middle school students are distracted while walking. This summer, I had the opportunity to work in the advocacy department at Safe Kids Worldwide in Washington, D.C. Some people assume that all we do is try to help pass laws, but that’s not the case. At Safe Kids, we think of laws as a last resort. In many cases, what can be more successful is getting the community to pull together to increase awareness about the problem. Simple activities such as putting up signs or spray painting the sidewalks are easy, cheap and effective ways to get your message across. Sound hard? It’s not. 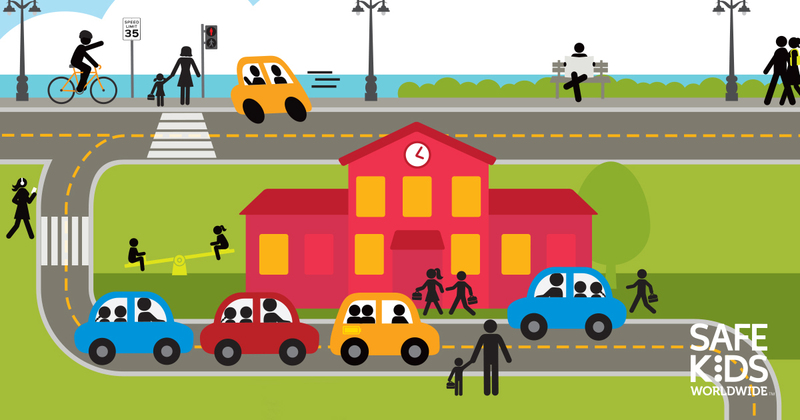 Safe Kids created a Take Action Toolkit: How to Fix an Unsafe School Zone to help ease public policy and save lives in school zones. It starts with a virtual map of an imaginary school zone with six danger areas, such as a dysfunctional drop-off/pickup area or a street where drivers habitually speed. You can click on the school zone risk area that changes in policy or infrastructure could make safer, opening up a very detailed but easy-to-follow action plan to start to make change. The action plans have template letters, sample social media posts, relevant facts and much more. You can go to the Action Against Distraction Plan and get to work. The action plan has printable signs that say “Heads Up, Phones Down,” teaches how to make changes in your community with suggestions for campaign strategies and provides tips for both parents and teens. This plan also provides facts about distracted walking that you can use to help raise awareness about the issue in your community. Remember, keep it simple and fun. Click on the link to learn more about how you can take action against distraction. If you have any questions, please reach out to the programs team at krosenthal@safekids.org.